The Carlo & Julian Estate Vineyard, first planted in 1991, is located in Carlton, now recognized as the center of a wine region producing Pinot noir of the highest quality and excellence. The Carlo & Julian Estate Vineyard was the first and for many years the only vineyard within Carlton. Design elements unique to the Estate Vineyard are the soil and exposure; nominally a somewhat eroded Woodburn series soil with a sedimentary profile of mixed glacial and marine origin, the vineyard planting is at the top of the terrace with excellent drainage of water and air. 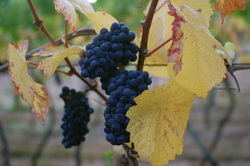 The relatively low elevation and proximity to Carlton make for warmer days than the surrounding area, low nighttime temperatures allow retention of acids and enhanced formation of anthocyanins and other phenolics in the fruit, resulting in excellent color, aroma and aging qualities to the wine.